In the final hours of April 2004, Tristan Sturrock, Kneehigh’s leading man fromBrief Encou­nter, joined the May Day festivities­ in Cornwall to celebrate the coming of spring. A buoyant father-to-be, his life changed in a moment that night… He fell off a wall. It nearly killed him. Instantly engaging, when Tristan walks on stage, his lyrical presence defies his assertion that this story is both his and true. 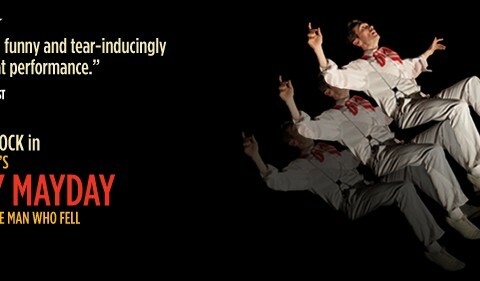 However, Mayday Mayday is “life affirming theatre at its very very best…” (The Cornishman). Tristan takes us through his solo tale of recovery with great wit, a few props and grand operatic flourishes. Mayday Mayday is a love letter to Tristan’s life and the people who saved it. Mayday Mayday illuminates vividly how resilient the mind and body can be, when the spirit never flags. Tristan Sturrock is a lively raconteur, and moves with nimble gracefulness around the stage, animating the story with the sheer warmth of his presence. ARTFULLY CRAFTED. If you like beautiful staging and good storytelling, then Mayday Mayday is for y­ou. Sturrock’s virtuosity as a performer blends perfectly with the wonderful staging. REFRESHINGLY HUMAN. Tristan Sturrock, the dashing British actor who stole our hearts in Kneehigh Theatre’s magnificent Brief Encounter, is one remarkably limber fellow. In his stark yet funny one-man show Mayday Mayday, the jaguar-like Sturrock contorts his body continually across the wide open stage at St. Ann’s Warehouse. SUPERB. A scary but heartwarming tale that reminds us, as he says, ‘how fragile we all are.’ By the time the show’s over, you feel grateful to be able to leave your seat and walk home. ABSORBING. Tristan Sturrock is ridiculously lithe and charming.